European scientists announced Thursday they had discovered antibodies which attack Zika, a step they hope will pave the way for a protective vaccine against the brain-damaging virus. 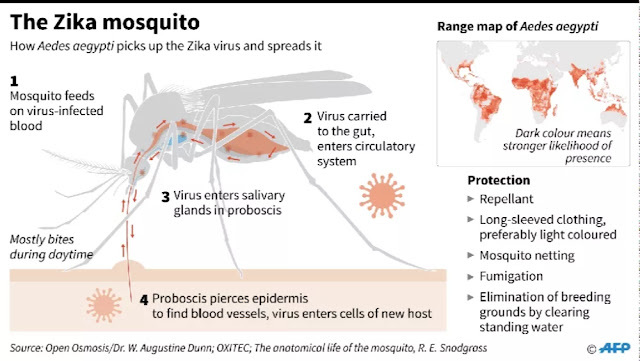 The antibodies -- frontline soldiers in the immune system -- "efficiently neutralise" Zika in human cells in lab dishes, and are also effective against its cousin virus dengue, the team reported. The discovery "could lead to the development of a universal vaccine" against both diseases, they hoped. The Zika-zapping molecules were obtained from people who had previously been infected with dengue and whose immune systems had produced antibodies to fight that disease. "The antibodies could be used, for example, to protect pregnant women at risk of contracting the Zika virus," said Felix Rey, a virology expert at France's Institut Pasteur who co-authored twin studies in Nature and Nature Immunology. "We never expected to discover that the dengue virus and the Zika virus are so close that some antibodies produced against the dengue virus could also neutralise the Zika virus so potently," he added. But Rey cautioned that a working vaccine is likely far off. "There is a lot still to be done, notably to conduct a clinical trial. This may take some time." Benign in most people, Zika has been linked to a form of severe brain damage, called microcephaly, in babies, and to rare adult-onset neurological problems such as Guillain-Barre Syndrome, which can result in paralysis and death. In an outbreak that started last year, about 1.5 million people have been infected with Zika in Brazil, out of a global total of some two million, and more than 1,600 babies born with abnormally small heads and brains. Zika and dengue are both transmitted by the Aedes mosquito, and are members of the same family of Flaviviridae viruses. While there is no drug for Zika, a vaccine does exist for dengue which causes flu-like symptoms such as fever, headache, nausea, vomiting, muscle pain, and skin rashes similar to measles. In one percent of cases it cases a deadly haemorrhagic fever which kills about 22,000 people a year, according to the World Health Organization (WHO). Dengue is endemic in Brazil. Worryingly, the same researchers found in lab experiments that apart from the two Zika-killing antibodies, the majority of other molecules active against dengue may actually increase Zika's potency. This suggested that previous exposure to dengue virus "may enhance Zika infection," said Gavin Screaton of Imperial College London, another of the study authors. "This may be why the current outbreak has been so severe, and why it has been in areas where dengue is prevalent." This finding highlighted the importance of using the correct antibodies in a Zika vaccine, said Rey. Antibodies are proteins produced by the body to identify and latch onto invader viruses, making them easy for the immune system to identify and destroy.